Robin Eubanks is the premier jazz trombonist of his generation. Whether performing with his groups, Mental Images or EB3 or with The SF Jazz Collective, Dave Holland Quintet / Big Band, Robin is an artist whose impact on audiences has proven powerful and lasting. Now with his current recording, Klassik Rock Volume 1, Robin cements his position as a progressive giant in music. Robin won the Jazz Times Critics Poll for Best Trombonist and is a multiple winner of Downbeat’s Readers and Critics Polls for Trombonist of the Year. He’s also won compositional grants from Chamber Music America and an ASCAP Composer’s grant. 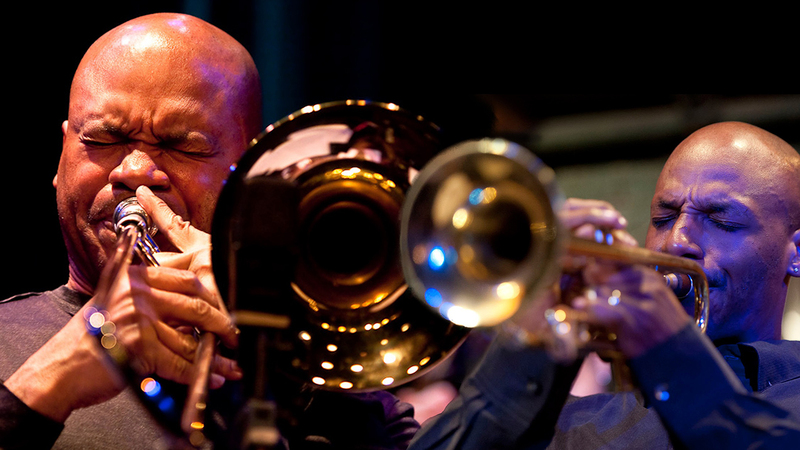 His brother the trumpeter, Duane Eubanks has performed everywhere from the Hollywood Bowl to Birdland to the Kennedy Center, in addition to touring throughout Europe and Japan. He is a member of Dave Holland’s two time Grammy Award winning big band and the late Mulgrew Miller’s band, Wingspan. Working in various genres of music is something Duane takes pride in. This has given him the opportunity to record and/or tour with The Temptations, Alicia Keys and many more great Musicians.